After a full day of walking, touring, and shopping, we were hungry as a hippogriff! However, we were close to the Flight of the Hippogriff, and Josh decided he was brave enough to ride it. Randy took him for a quick ride (not too quick as the queue had gotten pretty long) while LaRae, Katelyn, and I took a tour of Hogwarts and then went to watch the Toad Choir. The Hogwarts Tour, which I mentioned in an earlier post, allows guests to tour the inside of Hogwarts without standing in the usual queue. To do the tour, simply walk into the Castle through the gift shop and tell a wizard that you would like to do the tour. They will point you in the right direction which will take you through a hall of portraits that the regular queue does not go through. You will get plenty of time to wind beside the queue to spots where you have prime viewing to stop and view the holograms and other details of the castle. If you want to photograph the inside of Hogwarts, this is the only way to do it as bags and cameras cannot be carried on the ride itself and must be placed in lockers in the Hogwarts entrance. A full tour completed, we decided to go hear the Toad Choir. Their magic was waning though, and so they were unable to sing (sound system or microphones were acting up). Instead they moved to take photos with the crowd. Through the difficulties the choir stayed fully in character. When it was our turn to get our photo taken, they asked Katelyn about her wand. When she said it was new and that she wasn't sure how to use it yet, they requested that she not point it toward them. We all got a chuckle out of that! Requesting the untrained wand be pointed at the ground. We also took a minute to get some photos of the Hogwarts Express while we waited on the boys. photos of luggage that wasn't mine! 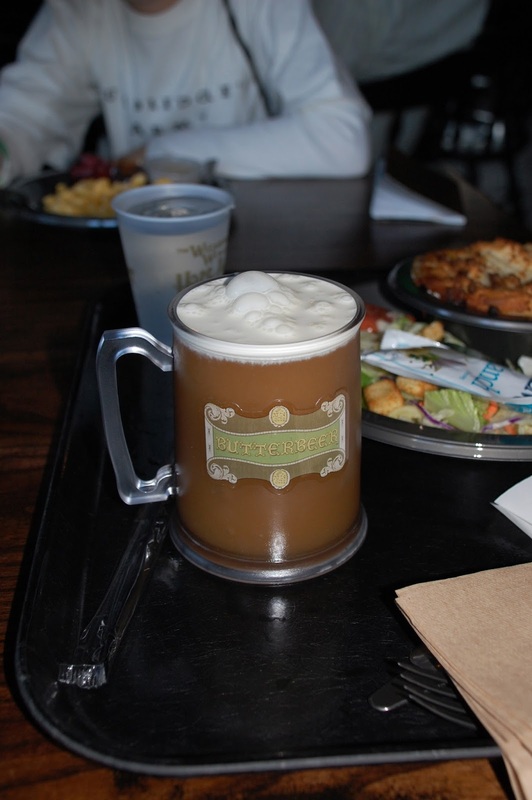 Photo opportunities completed, we moved toward having an early dinner in the Three Broomsticks. The atmosphere and decor here was, like everything else, perfect down to the minute details! Randy had chicken which looked like something Hagrid would order! He said it was cooked perfectly. I love Shepherd's Pie, so I was excited to try it here. It was delicious! of mine, but it was a yummy treat to try! While my family finished dining, I decided to take a second spin on Harry Potter & the Forbidden Journey. My app told me the queue was super short, and being a single rider, they did pull me to the front when I got to a certain point. I can't fully describe how much I loved this ride! I could ride it on loop! 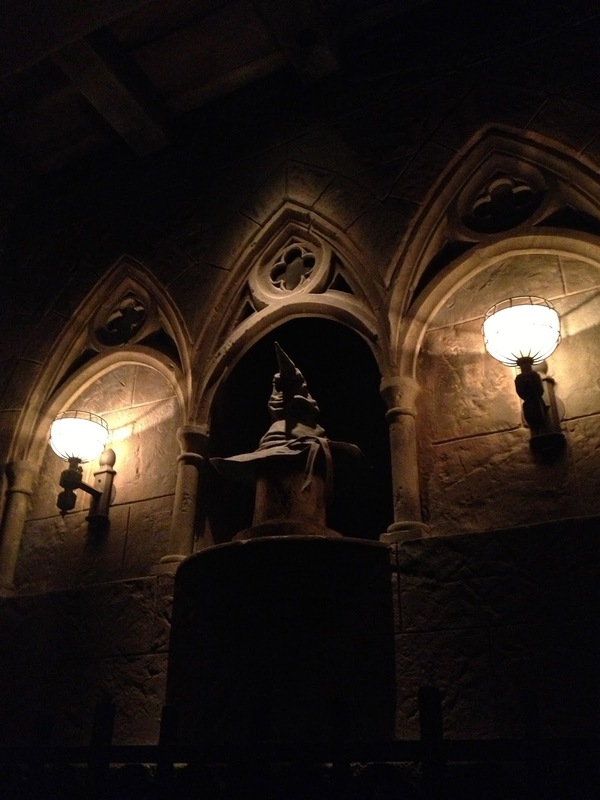 I kept my phone on me, so I could snag a photo of the Sorting Hat! On the way out, LaRae and Randy insisted that I go ride the Amazing Spiderman 3D attraction. It, like the Forbidden Journey, was a simulator that moved through rooms. I'm glad I rode it with LaRae as it was super incredible. At times I was ducking because it was hard to tell what was real and what was 3D imagery! Oh... just going for a spin in the Fantastic Four's ride, no big deal! No clue what this was, but I love me some X-Men! Finally the long day (with no rest time) was over. The entire family was exhausted and dragging on the way out of the park, but it was a good tired. We definitely had an amazing time at Universal Orlando's Islands of Adventure! Would I go again? Absolutely! Do I need to go there every time I'm in Orlando? Probably not. Come back on Wednesday, and I'll share the Universal vs. Disney rundown. Parking, downtown areas, ride storage, cranes, and more will be discussed!